One issue that has presented itself on Edgeworth is the disintegrating Hornby resin water tower. I commented on this a couple of months ago and the only good news is that a couple of applications of superglue and some internal splinting with brass wire seems to have cured the problem. If I'm honest though, the join is a lot more visible than it should be. Exhibition repairs and less than perfect breaks don't make for a clean restoration. Since this is the only ready-to-plonk structure on the layout, the solution is obvious - replace it with a kit. I recalled that Ratio produced something appropriate and set out to look for a kit at exhibitions. Surely this couldn't be difficult, after all the range is widely distributed. Sadly, no. Doncaster, Alexandra Palace, York. All were scoured without results. Eventually I began to doubt that the kit existed at all. Searches on the web didn't seem to bring back anything either. I assumed that I had been mistaken. 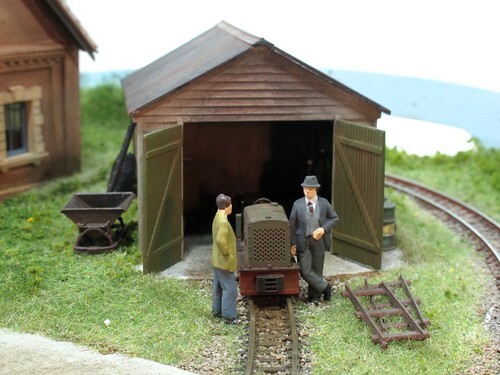 The Mastman Models kit isn't a kit in the way railway modellers would understand the concept. It is exactly what you get in the model boat world however. 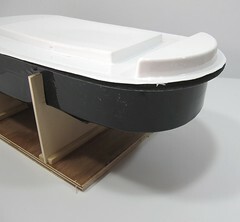 A vac-formed hull, deck and front fender are supplemented by a sheet of plasticard and some plans for the superstructure. Basically, it's an aid to scratch building rather than a shake the box model. I'm happy with this as it keeps the cost down and lets me build the boat I want. The idea is that the deck is trimmed to drop in to the top of the hull. As far as I can tell, this means that there will be a lip around the top edge - strong for a model and easy to build, but nothing like any of the real tugs. Never mind, this is all fixable and since the hull is very good indeed and I certainly can't make anything better - it will form the basis for the model I want to build. Running a ruler over the hull, the model works out at 1:24 scale, a normal one for boat modellers which should make buying a suitable captain easy. 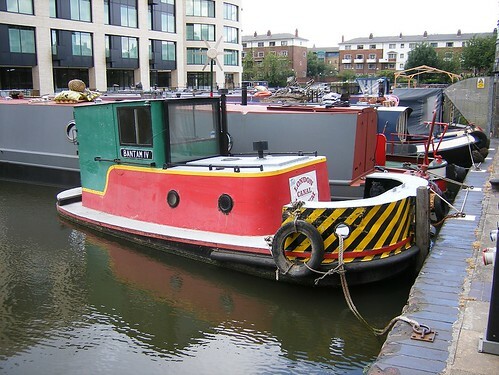 From Jim Shead's Website: During the fifties and sixties E C Jones & Son (Brentford) Ltd built a series of tugs which they called "Bantams". 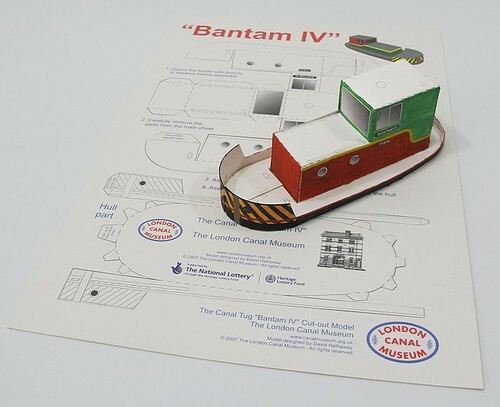 I first became aware of Bantam tugs when I visited the London Canal Museum a few years ago. In the basin at the back of the building is the museums own tug - Bantam IV. At the time I took loads of pictures as it would obviously make a fantastic model. Back home, some research showed that while above the waterline, things are simple and boxy, below it all gets but complicated with a very weird shape hull. Without a plan and with lots of other projects, the idea of a miniature Bantam remained a dream. 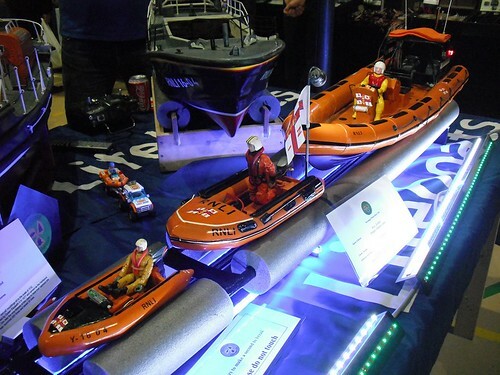 Then, at the last model boat show, Mastman Models were selling a Bantam kit. This had the hull and I reckoned I could do the rest. So, I dug out my photos again and also found a card kit from the museum that I'd bought 2 copies of. An hour or so later (the painting takes time), a 7mm scale waterline model was on the workbench. I was looking for a card kit the other day, working my way through a bookshelf, and I tripped over an old scrapbook. The pictures were falling out so I stuck a couple under the scanner. Both date from the 1980s - sadly I can't be more precise than this. 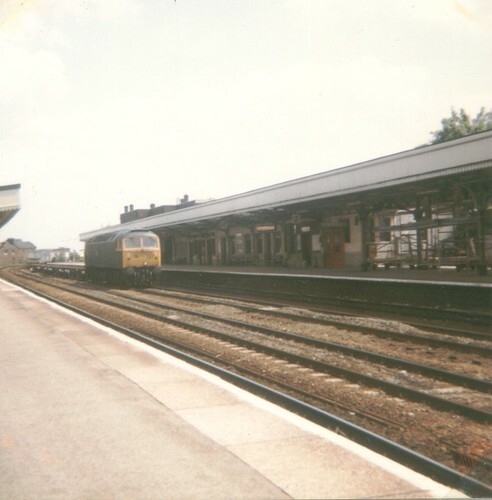 The first shows a Class 47 diesel pulling flat wagons through Leamington Spa station. The view today isn't very different as the building is listed so can't be altered much. The loco is probably long gone and even if it isn't, won't be pulling bogie flats on the main line any time soon. This was a last gasp from the "good old days" for train spotting when every train was headed by a proper loco and there were lots of different classes to look for. For several years, we took our summer holiday on a campsite in Kent. 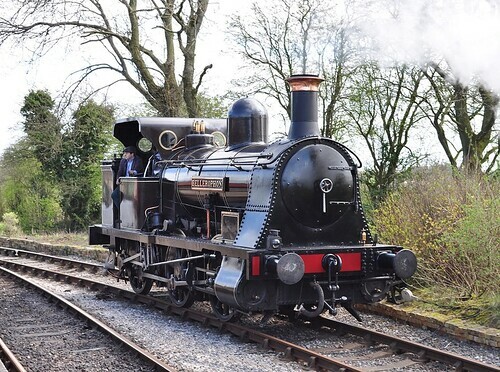 One of the attractions was the relative proximity of the Kent & East Sussex Railway. At the time it was a very friendly line and my father and I were so enamoured that we became members. This wasn't with any real intention of becoming volunteers, just to be part of it. 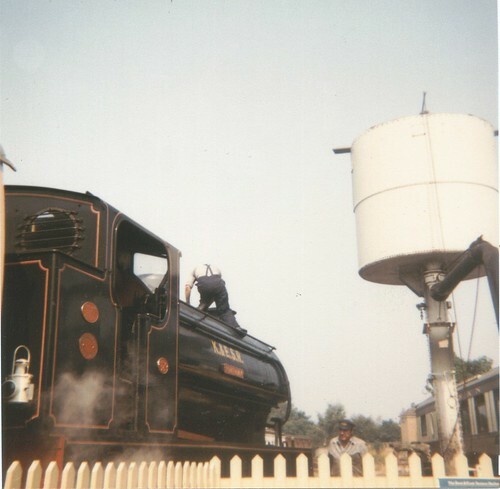 The photo shows an Austerity being filled with water at Tenterden station. In the background is a Pullman car that as I recall, was part of a dining set that did good business at the time. Sadly, we gave up our membership a few years later when I found myself refused access to the station during a Thomas the Tank day. I'd travelled down to Kent camping and hadn't realised it was a special weekend. This didn't worry me and I wasn't expecting to have a ride, but not being allowed to go to the shop and buy some binders for the magazine incensed me. Later on the same day, I followed the line to Robertsbridge where the Rother Valley Railway is based. There I found the friendly attitude that, at the time, had gone from the main group. At this time, the two organisations were at loggerheads despite trying to re-build the same railway. Apparently all this has now been resolved, maybe one day we'll be able to take a train all the way along "the farmers line". I won't keep you in suspense - my round trip to York show is 300 miles and it was worth every one of them this year. Visitor no.4700 started his visit with a trip to the restaurant at the top of the hall and enjoyed some tea and chocolate cake. For around the same price as coffee and cake at a chain shop in the town centre, it was just what I needed after 2.5 hours on the road. After this, it was down a floor to see the exhibits. 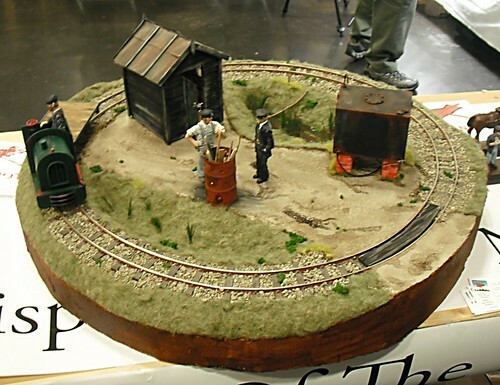 As my father and I walked in to the room we were hollered at by a gentleman from the Hull model railway club. Dave Birks (for it was he) has lost around half his body weight and the role of tea boy in the exhibitors refreshment lounge. This means he will no longer rescue people from excessive deserts in pubs and that we weren't going to get a free drink later on. He was sat behind a rather nice N gauge layout - Martini Junction - which had some fantastic colourful civic gardens. After this we found the EM gauge Stoke Gabriel which looked like a nice follow-on plan to Edgeworth. A through station, it has bay platforms and plenty of operating potential. 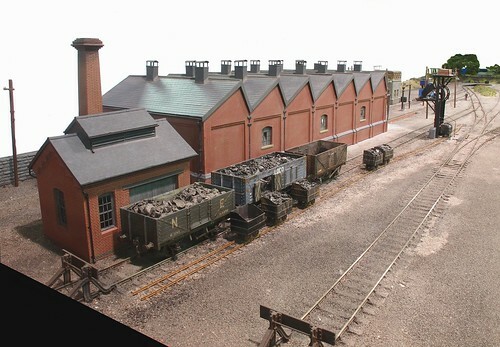 Not a flash layout by any means but the sort of realistic model that you'd be proud to have built. 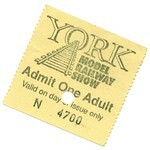 Finally, there was the MOMING14@YORK collection. Half a floor of micro layouts based on minimum gauge railways. 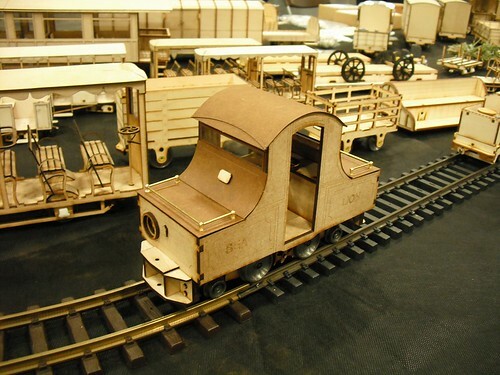 Many were in the larger scales of G and even 1:12 scale but running on OO and O gauge track. I found the who display inspiring. 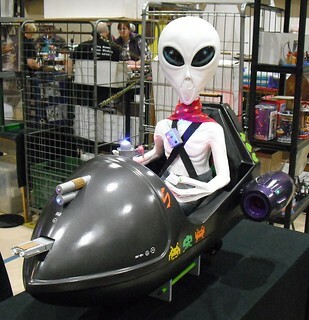 OK, the operational possibilities weren't much to shout about in many cases, but the modelling and imagination was fantastic. Chris Payne organised this and deserved thanks for pulling a very different display together. I'm certainly inspired to have a go at something similar - when I've finished all the other projects of course! After this, I know I talked to a lot of people and looked at even more layouts. I spent some money too - mostly on bits of magazine projects but also some interesting pamphlet type books that I'll be bringing to you in the future. Another trip for drinks (large bottle of orange juice) and cranberry and orange cake (also very good) and we headed to the ground floor. It might seem perverse working from top to bottom of a show but in this case it hopefully allowed us to avoid the worst of the crowds. I understand that numbers were slightly down this year but it didn't seem like it. Presumably the late Easter and good weather kept some of the families away. Pity, they missed out. The ground floor was rushed around a bit as closing time was approaching. Leighton Buzzard is always worth a look as you don't see models dating from a time when everything had to be made the hard way very often. Leicester South is a huge layout with a real look of the late BR steam period. Novelty provided by the motorised vans to replicate capstan shunting appeals to me too. Anyway, as usual, loads of chat, some good trade and more inspirational layouts than normal. Go and have a look at my photos on Flickr. Edit: Any reference to food has now been crossed through to avoid offending people. The great tramcar sale continues over on eBay and we are gradually reducing the pile of Corgi diecast models and increasing the garden railway locomotive funds. 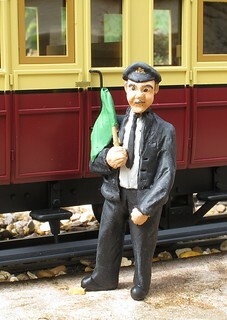 It's interesting to see which models are popular in the world of tram collectibles. I'd expected that the early models would be rarer than later ones and therefore more valuable. It seems the opposite is true. Less surprising is the lack of interest in the 7mm scale American Birney trams. They are lovely models and fetch nothing. I can't understand why the 7mm narrow gauge fans aren't snapping them up, sticking a SPUD underneath and making NG railbuses out of them. Either that or stick a normal chassis underneath for an interesting coach. 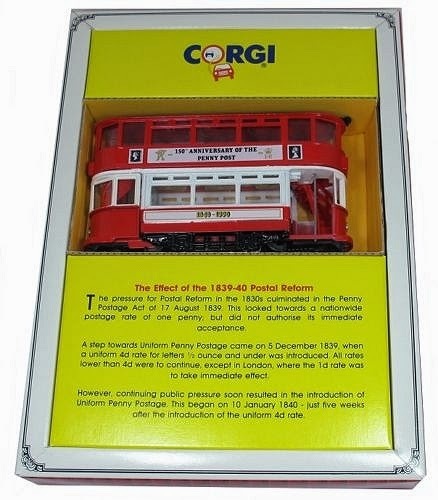 The saddest model of the lot though, is this Penny Post commemorative tramcar. It's in it's box and lovely condition but now on the third re-listing as we try to find anyone who will over it a home for £4.99. Some one must collect stamps and postal memorabilia out there. Go and have a look at all my current eBay auctions, it's not just trams! Railway uniforms tend to be black so I gave the guard a quick once-over with some Humbrol 33 after picking out his shirt in 147. On it's own, the black looks a bit stark so I left it half an hour and dry-brushed with No.69. Getting this done before the base coat is fully dry allows the two to mix slightly hopefully avoiding any sharp colour changes whilst taking the edge off the black. I probably over-did it a bit but then on my garden line, the uniforms are like the rest of the place, a little tired and care-worn. Anyway, the flag is a nice bright grass green - these things are very loud in real life for good reason. It's attached to a pale brown stick as the ones I've seen aren't the dark brown you get from track colour. The cap badge is gold paint dabbed on with the end of a small screwdriver. Easier than a paint brush and there's no clean up afterwards. Finally a shot of matt varnish unified the look and he's ready to signal trains out of the station. I picked this figure up from a box at the end of the Modeltown stand at Peterborough. He was in a box of cheap figures and I liked the look of his pose. Anyway, I'm assuming that he made it in the cheap box due to some air holes under his elbow and on his nose. A quick splodge of filler took care of these. The resin he's moulded in felt slippery so the next stop was the kitchen sink for a scrub with washing up liquid. After this, a shot of Halfords car primer made it easier to see the detail. The white resin is as difficult to see in real life as it is in the photo above. Getting some colour on there made life easier. Finally (for today) Humbrol flesh tone was dry-brushed with it's Revell equivalent and the eyes picked out with a small brush and some track colour paint. Paul asks: Where do you get the resin tanks from that you use on the warflats ? 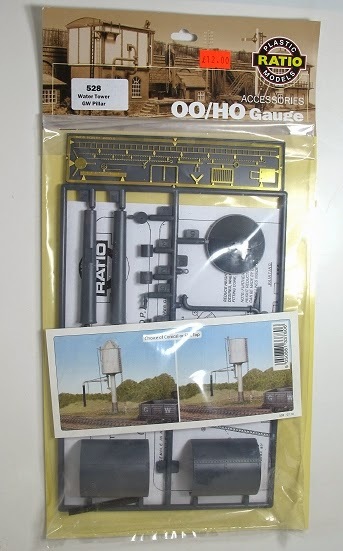 The simple answer is that they can be supplied with the kit when you buy it from the Double O Gauge Association. However, this isn't very helpful. As I recall, the supplier is Gramodels who produce a range of military hardware in several scales. 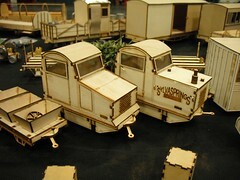 I recently used a Ferret armoured car on my pizza layout for BRM. When loading a Warflat, remember that not all armour will fit within the loading gauge﻿. Early tanks and armoured cars will be fine but you won't squeeze a Challenger through a tunnel! It's Easter and to me that means chocolate eggs. Yum! 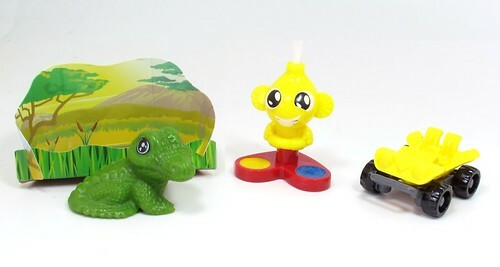 Anyway, this isn't a blog about chocolate, it's about making things, so looking for a connection, I decided that the ideal topic for today would be the contents of Kinder Surprise eggs. My local newsagents were sold out but the nearest branch of WH Smith furnished me with a broadsheet newspaper and 3 of their 4 remaining eggs. I left the last for any small children who would otherwise miss out on a treat. An alligator. While the figure is a solid lump of plastic, the cardboard scenery does need to be folded and clipped together. The resulting pond isn't the most realistic I've ever seen but if you prefer, by reversing the folds your new pet can sit on a river bank. I decided he would prefer a swim. A painting set. Clever this one. The yellow figure with bristles pointing out of his head is a brush and can be removed from the red feet that contain water based paints. Blue and yellow don't seem like the most exciting colour combo in the world but then you can make green as well. Mind you, the instructions on the pictures to colour in don't show any mixing, just different shades of the base colours. Seems a bit limited, don't think Humbrol will be copying this. A beach buggy. 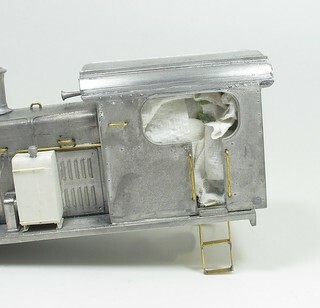 Two parts, the grey chassis and yellow body clip into each other. The wheels are pre-fitted, probably by someone who wishes they didn't have to sit doing this. By pushing down on a plastic paddle at the back of the chassis, the car speeds away. Excellent play value. I'm tempted to paint this one. 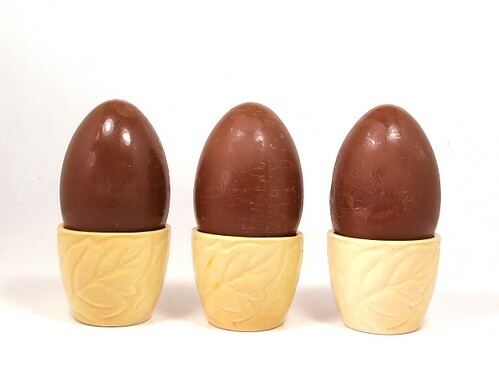 By the way, the chocolate is horrible and if you live in the USA, according to Wikipedia, you don't get toys in eggs as they will kill small children. Peterborough showground. Home of the best chocolate cake in the world. Or at least it used to be three years ago. Sadly there's not sign of it. Perhaps some lucky git ate it all before I got there. 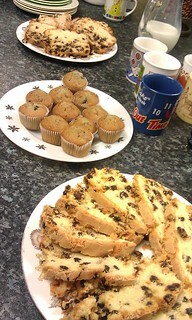 Anyway, cake quality aside, I was at the showground for the 16mm Society AGM. A big hall full of garden railway goodies. Actually, it wasn't quite a full as it has been in previous years. High stand fees seem to have caused a few traders to drop out. There were certainly people missing from last year such as IP Engineering, Glendale Junction, Tuxcraft and Flexiscale. Doubtless there were others who I couldn't name. Not to worry. I'm not looking to add to my stock of garden railway kits at the moment. I only went to have a look around. A show gets my seal of approval if there is a model that makes me want to go away and reproduce it, or at least my version and this was the case here. Sadly, my photo is a bit rubbish as I don't think the camera has ever recovered from being dropped on the cobbles at Scarborough. Never mind, you get the idea. A 16mm scale pizza layout just over 3 feet across. Plenty of detail on display. Some quality modelling despite the novelty subject matter. I'm already thinking how I could use take the idea and produce my version of it. Of course, there were plenty of goodies to tempt the wallet. 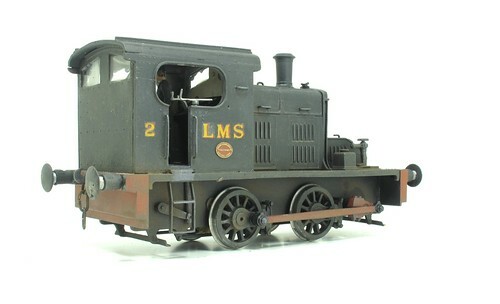 A 7/8th scale laser-cut kit for the Groudle Glen electric loco Sealion is high on the list. 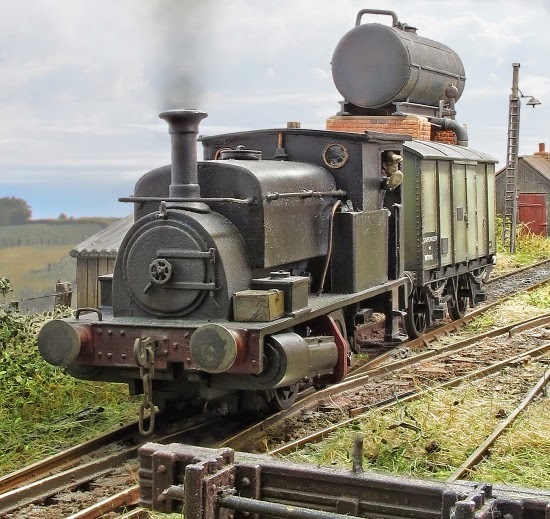 I have the 16mm scale version of this Yatton Engineering kit the stash to build but despite not being that much larger, the 7/8th version looks even better. Of course the Accurcraft steam Sealion already on order does kind of push my thoughts in that direction anyway. Anyway - head over to Flickr where the photos are. The square wheel Bagnall is especially clever. 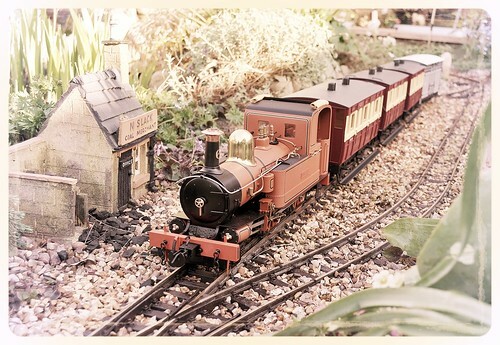 It's spring time so the garden railway comes alive properly. Track ballast has been renewed. Rails have been cleaned. Plants have been pruned. While we had the Peacock out I couldn't resist taking a photo, and then couldn't resist fiddling with some effects. Enjoy! 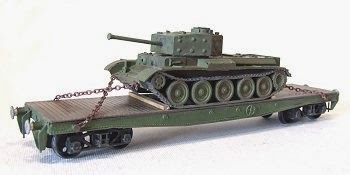 I needed some chain for a garden railway project earlier this week and the stuff supplied with the kit was far too small. "No problem", I thought, "I'll quickly make some up." The technique is simple enough. Wind wire around something round to form a sort of spring. Then cut along the length so it falls apart into individual links. Using pliers, bend these and make them into a chains. If you need oval rather than round links. squeeze them as you link each one up. 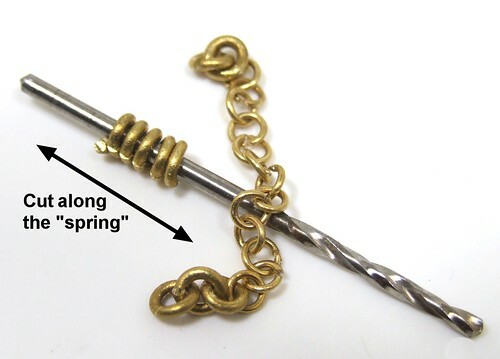 My first attempt was with 0.9mm brass wire around a 2.5mm drill bit. This wire was a bit fat and the resulting links were tight when assembled. Bending the wire with pliers was harder than it ought to be too. 0.7mm worked a lot better. The links can flop around properly and manipulating them with 2 pairs of pliers wasn't too hard. I still wasn't happy with the result and so resorted to some I had in stock. A fatter drill bit or even some Code 100 rail to wind the wire around would produce better links and if I used the rail, they would be the correct shape too. I recently painted a model grey by spraying it with Halfords primer. 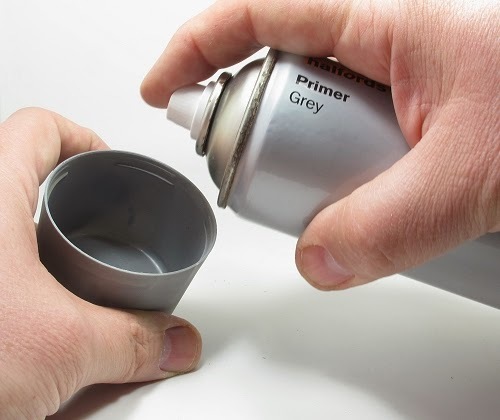 It's lovely paint that applies straight from the can very well indeed. The problem was that after a little hand lettering, I needed to touch up the grey. Only a little and that was the problem. Not enough to warrant masking and re-spraying. At this point I wished I'd used proper paint in tins. Never mind, I decided to have a go with the primer. A little was sprayed in the cap and then picked up on an old brush. At first it was a bit thin but after about half a minute, the solvent seemed to evaporate leaving just paint. In the few second between becoming paint and becoming dry, I was able to tidy up my work with a matching shade. OK, it's not perfect and I was working on wood which being porous is more forgiving, but it looks fine. OK, I'm busy at the moment so please head over to the BRM Blog where you will find a little post I put together yesterday on my trip to the National Brewing Museum in Burton-on-Trent. Before we went to the museum, we drove around taking photos of interesting buildings and I've posted a load of these for your information and entertainment. There's also a picture of a ham roll and pint of beer. What more could you want? Head over to read about my trip to Burton. Funny the things you find kicking around the magazine collection of your local model railway club. 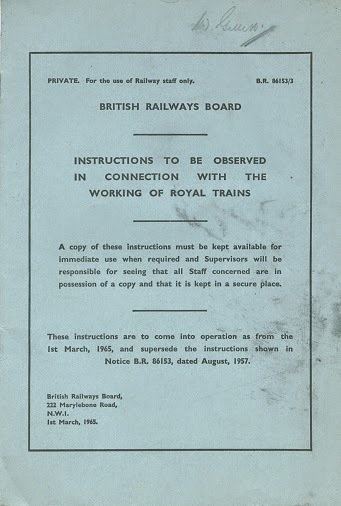 Here we have the Instructions to be observed with the working of royal trains. Shunting operations on any line or siding next adjoining the line on which the Royal Train will run must be suspended at least 10 minutes before the Royal Train is expected to pass the site of the shunting operation. It appears that Royal personages were not to have their sight offended by seeing the ordinary working chap actually doing some of his ordinary work. This gives us modellers the prefect excuse when there is a break in operations. Just say, "There's a Royal Train on its way mate." and no-one can argue. It will probably come as a surprise to many people who know me, but one thing I've never done, until yesterday, was ride on the footplate of a railway engine. 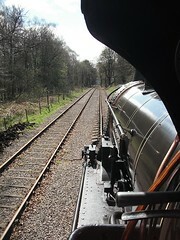 Obviously I've ridden behind all sorts of engines but as opportunities to sit or stand next to the driver are limited. Bothering someone doing a complex job to be allowed to clutter up the cab doesn't seem fair. Anyway, for some magazine work I was at the Foxfield Railway and offered the chance to loiter in the cab corner travelling from the top station at Dilhorne Park to the terminus at Caverswall Road. While the loco is effectively coasting downhill all the way, I wasn't going to say no. My steed for the trip was the 1874 built locomotive "Bellerophon". As one of the few engines I can picture in my mind when it's name is mentioned, this just made the opportunity even better. The cab isn't large and nor is it protected from the weather. The day was sunny but with a cold wind. The front sheet might well be larger than when the loco was built but it doesn't wrap around the sides and the wind was coming across us. Heaven knows what it was like when the loco worked day in, day out, at Haydock Collieries. Either men were harder then or just knew that if they complained, there would be someone else along to take over their job. Admittedly there is a nice warm fire and our fireman for the day toasted his hands by it briefly, but in such an airy cab, the heat soon dissipates - far more than I had expected it would. Having said this, from what I've seen, working hard on an express engine in more enclosed conditions was a far warmer job and not in a good way much of the time. Our run proceeded at 15mph. I asked how fast and two smart phones were produced and GPS consulted, the loco has no speedometer, just vacuum and pressure gauges. Despite some sharp curves dating back to the lines origins as colliery railway, it was smooth too. A recent axle-box fettling and some interesting equalising beam suspension saw to that I guess. Thanks to everyone who made this happen. I was well chuffed (pun intended). To go to Coalville or not? That was the question this year. The event has snuck up on us without really noticing and I was busy first thing in the morning supporting my sister when she took part in a 10K run. This was over by mid-morning though and with the event only an hour away, we went for it. Basically, no-one knew. The organisers seemed reluctant to enlighten anyone either. There was no website and not even an official announcement on the forum. Odd. The problem is that for this sort of event, trade matters. Ordering on-line is OK but sometimes you want to have a dig through the bits. You might even buy things you hadn't expected to want. Based on the drop in trade from year 1 to 2, we ha;f expected to walk in to an empty hall. As it was, the hall was fuller than the first year. Trade was good, displays were good. Some we disappointed by the lack of water to sail on but I'm not that fussed. I picked up all the bits I need to make my next project work. I could have picked up more projects but I have enough already thank you. Had I taken along some photos of the prototype, something precluded by the last-minute decision to go, I'd have picked up some detailing parts to. Never mind, I have a pretty good idea where these are coming from. Boats on display seemed restricted in subject. Although there was something for everyone, it helped if you liked lifeboats (I do) or grey boat (not fussed) as these were heavily represented. Anyway, a good show. We'll probably go next year. Maybe then we'll be told in advance who will be filling the hall up. Finally, after over 15 years ownership, my Fowler diesel shunter is finished. The black bodywork has been washed with brown to give those lovely mucky nooks and crannies, then dry-brushed with dark grey to simulate highlights. After this a gentle airbrushing with some earth, dark grey and track colour blended everything together. A light dust of powders just finished the job. Glazing is Krystal Klear. Plastic would probably have been better but you have to cut it to fit the rebates before glueing the roof in place. This looks OK though even if it was a pain to do. A driver leans on the controls. I've positioned him so he looks out of the side as though planning to look forward or backward at any moment, well it is a shunter and I think this is better than reversing while looking out of the front. Anyway, he settled like that and the glue dried and I decided he looked pretty good. All in all, the Eric Underhill kit is very nice indeed. At 615 grammes, it won't need any extra weight to keep the model in the track. It could probably out-drag one of those Ixion upstarts too. Mind you, I didn't anticipate their existence when I bought this! 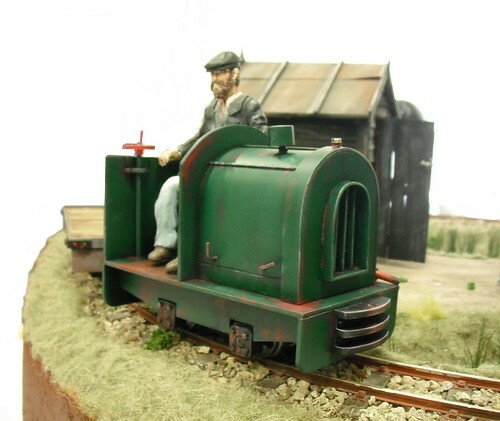 Look at this - I've painted the Fowler shunter at last! 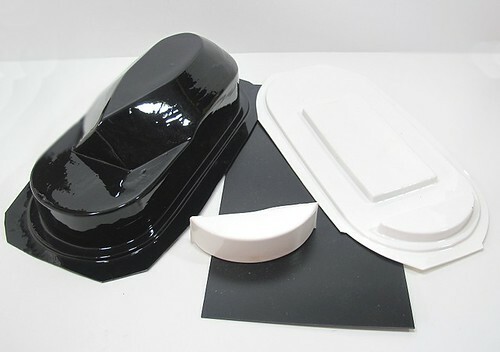 After a blast of Halfords grey primer, the black comes from a Revell spray can - 34302 silk matt Black. Once left to dry overnight, the result was a very nice, smooth finish. I was quite impressed. The red bits are Humbrol red satin varnished - all applied by brush. The red isn't really a deep enough colour but the easiest way to get this is their gloss paint and that takes an age to dry. Once weathered, it will be fine. Transfers are some old waterslide ones. The silvering behind the letters doesn't show in real life nearly as much as it does in the photo. Pedants will point out that on the real loco the letters were gold but unshaded and the number should also be sans serief. I had these to hand and din't have to go any buy more. I prefer this to the correct versio, especially the number 2 which looks nasty in real life. If I must have an excuse, I'll say that I'm assuming a repaint at some point before the loco moved to whichever ficticious bit of track I'm claiming it is being run on. 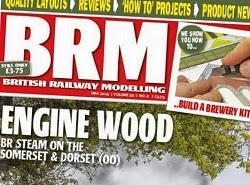 The new issue of British Railway Modelling ought to come with the slogan, "Please enjoy BRM responsibly" splashed across the cover for there is a definite beer theme to many of the articles contained within it. My first contribution is a pair of wagons for transporting ale. One in 7mm dating back to LMS days, the other the 1970s paletised ale version in 4mm scale. These are an interesting contrast in both assembly and design. 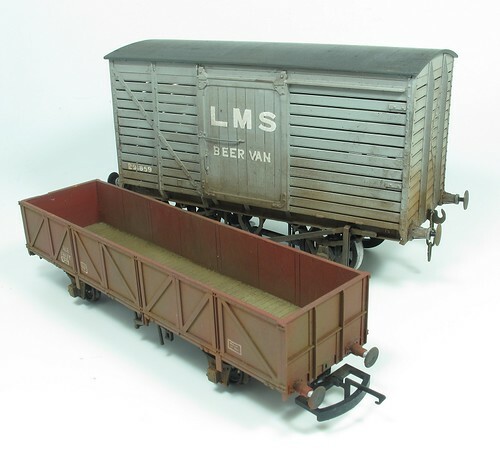 The LMS beast is pretty much a standard wagon but with slatted sides to keep the product cool as it was transported. The kit is standard Parkside in this scale too - axleboxes moving in their W-irons should smooth out most lumps and bumps in trackwork. The brake gear is fiddly, and in my opinion, needs to be re-jigged slightly as it doesn't align with the middle of the wheel very well. Not a difficult job and you could ignore it, but this does show that the kit has been around a while. 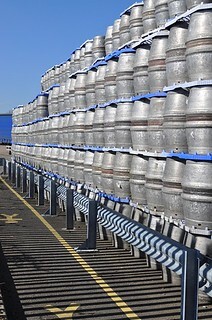 In the 70s, all the barrel rolling had stopped and casks were strapped to pallets to be loaded using forklift trucks. This demanded a different type of vehicle for rail transport. Now the sides needed to be removable for speedy loading but it appears we didn't need a roof any more - presumably the casks were considered difficult to steal and waterproof enough to survive the rain! Away from the workbench, Any York and I visited the National Brewery Centre in Burton-on-Trent to have a look around. While there he took new photos of the fantastic N gauge model railway that shows the centre of Burton in the days when it was full of breweries and level crossings. The museum is a fantastic place to visit with loads to interest everyone. You can ride a simulator that takes you through the streets of the town by train, look at packaging through the ages (I know that doesn't sound exciting but it is fascinating), meet Shire Horses and have a close look at the drays they pull, and even enjoy a pint from the two micro-breweries on site. Before the Bridge though, we'd toured the outskirts of town looking for interesting buildings to pantograph. 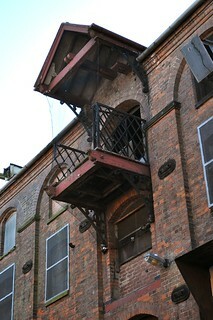 The veranda shown here is just one of the many details on the warehouses still standing. While most have been converted to office use, many original features remain and are well worth seeking out. After all that beer, some food is in order and this month sees Part 2 of our Pizza layout. This time the layout loses the snow scene under a load of static grass and flock powder. 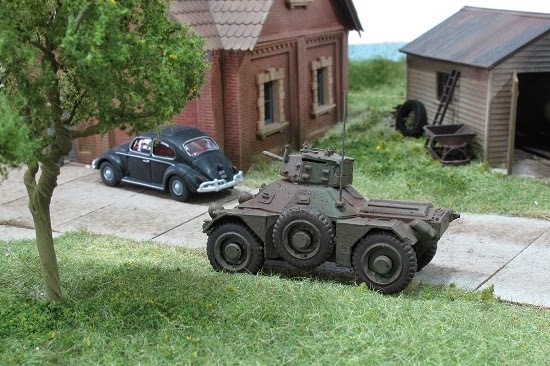 There's quite a log of detail added too including a Ferret armoured car. I've already been picked up on this having a rare, but not unheard of, turret. In my defence, I just built the kit and all this camouflaged stuff looks the same to me. Not to military modellers though. 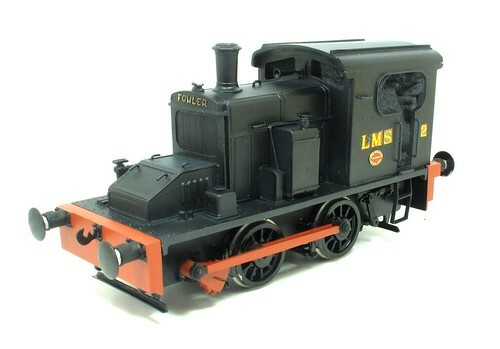 Truth is, my first choice for this layout would have been an Alvis Stalwart but when I carried out a little research it turns out that these things might be good on water but they were hopeless on hard surfaces so probably inappropriate for my concrete road. Finally, not one of my projects, but I have a to give a mention to the layout Juniper Hill. 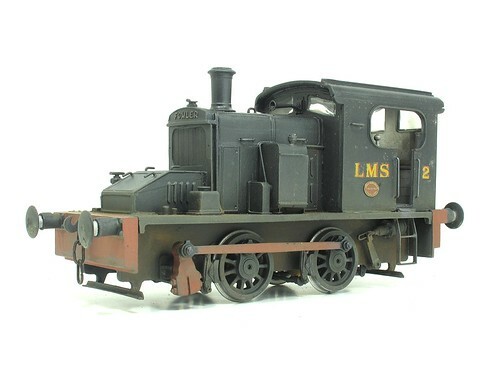 The piece on this opens with a model of a Hunslet built on a Hornby L&Y Pug chassis. Builder Mark Branson credits an article I wrote many months ago in Hornby Magazine for inspiring him to have a go at this conversion. As I always say, it's really gratifying when anyone has a go at some hands-on modelling because of something I wrote. To see the results pop up in a print is even more special. Not everything with the Fowler is going to plan. For its last exhibition, I stuck the roof in place with a few small dots of superglue to stop it falling off while we ran the loco in its "Silver Jubilee Livery". I'd painted the interior but thought that I could break the weak glue joints later and mask the inside properly. Stupid superglue. I'd need a chisel to break these joints. Why aren't they this strong when I want them to be? Anyway, the roof isn't coming off so I've disguised the joins with more glue and a touch of Deluxe Materials filler. Before I spray the body, to keep the paint out of the cab, I've stuffed it full of small bits of kitchen roll. Not nearly as good as tape but at least they cover the worst of the detail. I just hope it's still there when I gently pull them out later! Right - First stalled project to come back to life is the Fowler diesel shunter. The model is finished and ready for paint so I've started by priming all the brass bits. Normally I like to use an aerosol can for this but this doesn't seem smart around the mechanical bits. Quite frankly, the fact that these work as well as they do is a source of amazement to me and I'm not going to mess that up by squirting paint everywhere. So, a brush on primer is called for and I dug out a pot of Humbrol number 1 acrylic. While it doesn't seem the grab the metal in the same way an etching primer does, it's fine for areas that won't be subject to handling such as the brake pull rods and guard irons. Best of all, the brush can be cleaned up using water. I still used an old one though, just in case. If you are sitting there thinking, "I wish I could read more of Phil's drivel to stave off the time when I have to go back to driving an Excel spreadsheet." then you're in luck. 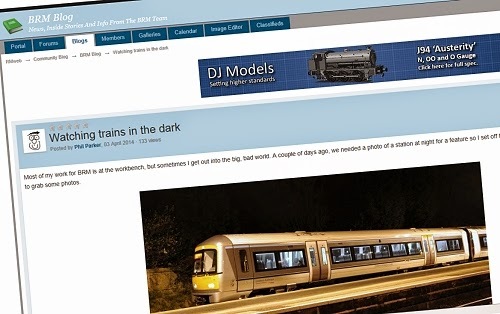 I'll now be popping up from time-to-time over on the new British Railway Modelling blog. This will be full of behind-the-scenes anecdotes and information. You can see what the team get up to producing each edition of your favourite magazine. Don't worry about this stemming the tide of wittering on this blog, I've got plenty of stuff to talk about, starting with a bit of a catch-up on some stalled projects tomorrow. 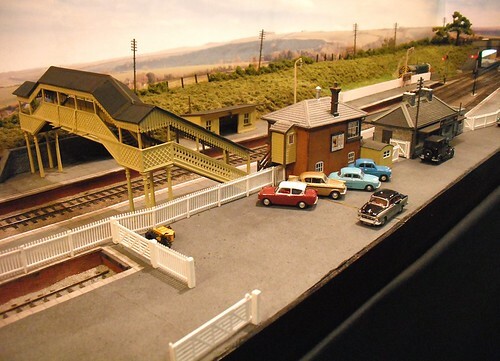 The British Railway Modelling blog. 5 a day the L&WMRS way! According to recent research, we need 7 portions of fruit a day, not the 5 previously recommended. In terms of hard-hitting news, this can safely be filed under "No S**t Sherlock" as there can't be many people who hadn't worked out that more fruit and veg was better for you than less. It was probably a slot news day or something. Anyway, you will be pleased to see that someone at the Leamington & Warwick MRS has taken this to heart because look what we found on the tea bar this week - lashings of fruit cake! The members, also having read the research and taken it to heart, tucked in with enthusiasm and soon there were healthy modellers all around, stuffed to the gills with cakey currents and blueberries from the mini muffins. Who says railway modelling isn't healthy hobby? 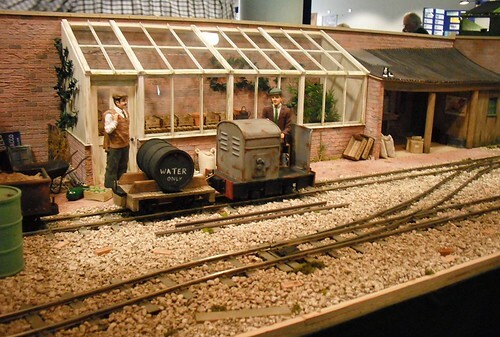 Elsewhere, I had borrowed Kimble, the club O gauge layout, as a background for some photos of a model I've built. While waving the camera around, grabbed this rather nice shot of the engine shed from the station overbridge. 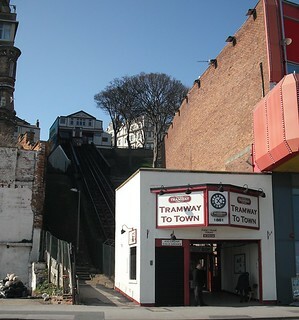 Scarborough has three funicular railways. For reasons I can't explain, although I'm sure someone can in the comments, the one on the right as you look at the town from the sea is called the "Central Tramway". Maybe it's because the top station is the nearest to the centre of town unlike the other two which don't seem to take you anywhere useful at all. 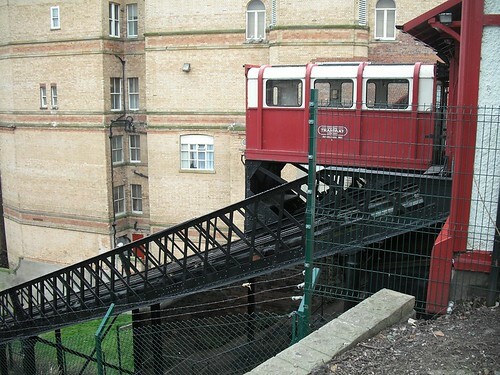 I love a funicular. Many years ago, I built a model version I was rather proud of. If I see a cliff tramway, I can't help but want to ride on it even if it's just a return trip without getting out at the top or bottom. As it happens, in March, Central was the only one operating. 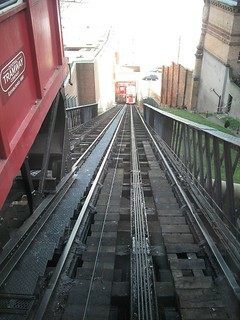 For 80p you enjoy a short ride along the 234 feet of track, rising or falling on a 1 in 2.8 gradient. 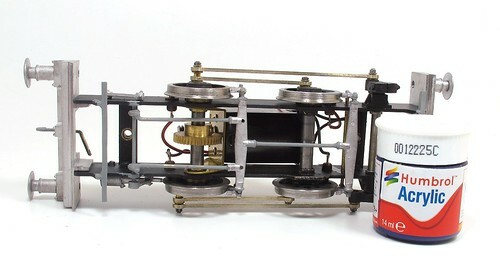 For enthusiasts, the track gauge is 4ft 8.5inches (standard gauge) and the system is driven by a 60hp motor. The cars are made from aluminium and date from 1975, built by George Neville Truck Equipment of Kirby in Ashfield. These replaced a pair damaged by fire. How do I know all this? Well at the top station, you can buy a set of postcards and an excellent history book on the line recently produced after the 2012 refurbishment that saw the return of the maroon and cream livery used in the early days. This is a lovely little line, sandwiched between buildings including an ugly amusement arcade. The view over the bay is great and it's a lot easier than climbing the steps from the front the town too! There's an excellent website for the Central Tramway too. To finish this weeks display of noisy gizmos, a little message from Captain Black. For those who aren't fans of everything Gerry Anderson made for TV or film, Captain Black is a character in the series Captain Scarlet. More than this, he was the first Spectrum agent seen and after being killed on Mars, became the central villan for the series. Taken over by the Mysterons, he did bad stuff. Look, if you need to know more, head over to Wikipedia where I've just spent 20 minutes reading all the stuff on the series and since it's Friday, so can you. 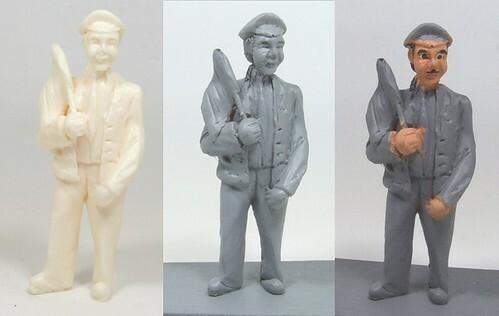 Anyway, the model Captain Black is a 12 inch tall plastic doll. Most people will have bought the series lead, Captain Scarlet, but I guess he will have said goodie goodie things. Black has far more interesting words eminating from the mechanism in his chest: "This is a the voice of the Mysterons", "We will take our revenge" and the one I've picked for the film above. If everyone has a Hornby Supersound kicking around somewhere, this is a slightly rarer beast. 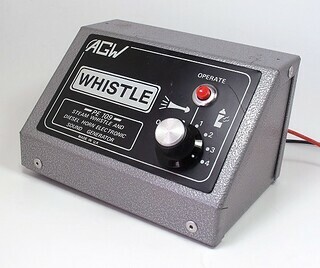 The AGW PE 109 Sound generator appears to date from the 1960s - it's metal case is shared with a rather nice transistorised controller the same company produced from the time. 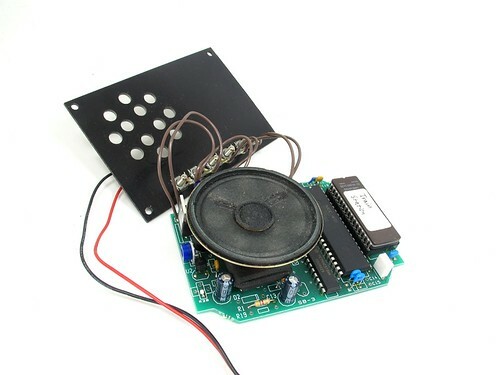 On the back, there are inputs for 15V AC (16V works just as well and is more readly available from model railway controllers), an external speaker and something called "Remote"
I'm assuming this last input replicated the operating button on the front face allowing some cleaver jiggery pokery that will fire the sound when a loco passes a Whistle board or similar. Either that or you can mount remote buttons around the layout. Inside the box is a speaker that provides plenty of volume - there is no control over this. On the front, a rotary switch, also shared with the controller, selects between a single diesel horn and 4 increasingly shrill steam whistles. There's an Off position too which seems superfluous but someone must have thought it a good idea at the time. The operating button is a pleasing red colour as all such buttons should be. If I'm honest, the sound isn't very good. More white noise - the unit must have an AC feed presumably to provide the necessary "wobble" to drive this. I tried a 9V battery and only produced a single click sound. Anyway, sit back, fire up the video below and enjoy the sounds of the (nineteen) sixties. Yesterday's sound system for railway is all very well but the results are American. What can we find on offer on the civilised side of the pond? First contender from my cupboard of stuff is this R512 Hornby Supersound unit produced some time between 1992 and 1995. When sold as a separate item, the cost was a whopping ten pounds. This is the cheapo version, and earlier type had connections to the track so the "chuff" could be regulated to match the loco as well as making both steam and diesel whistle/horn sounds. As you can hear from the video, the sound quality is a bit limited with various flavours of white noise doing service instead of digital recordings. There were plenty of circuits around to let amateur electronics whizzes build the same sort of thing. As I recall, they might have sounded better than this, but not much. Hornby must have liked these as there is a version for Scalextric as well. Another gizmo for your delectation. Just like yesterdays, this one came from a second hand stall but it only cost £2.50 and it actually works. QS Industries in America produced this little device that provides a random selection of typical station noises - announcements, clanging bells, babies crying, nearby motor traffic etc. Just give it some juice, I used a 9V battery even though it says 12V, and it will sit there making sound all day. The sounds are pretty convincing, although that baby is a bit loud. I like the echo on the announcements though. Inside there is some pretty sophisticated electronics including a big chip labeled "Train Station" (yes, I know, I hate the phrase too) so presumably other sounds are available. Sadly, the website is a bit short of information so I can tell you know more.